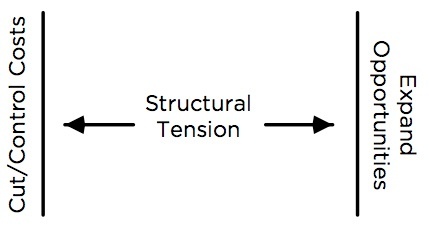 Robert Fritz, in his (great) book Path of Least Resistance: Learning to Become the Creative Force in Your Own Life, explains structural tension and how understanding this concept enables you to understand why people do what they do. Simply put, people will take the path of least resistance – which is typically going to be the path that presents the least pain or (this is important to understand), reduces the area of the greatest pain. 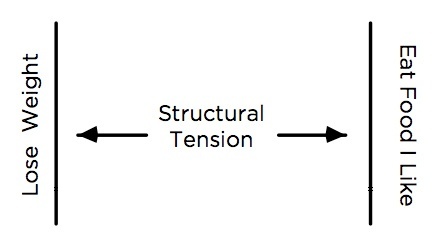 For example, understanding structural tension clearly explains why people tend to yo-yo with their weight loss efforts. As Fritz explains it (and I'm oversimplifying here), people who struggle with their weight tend to have competing beliefs. On one side, they have a belief that they should be healthy so they try to keep their weight under control; on the other, they have a belief that they like rich (fatty) foods. Rarely is their situation in balance. When they feel healthy (their pants fit), they experience very little pain from the belief that they should be healthy. Because they feel no "health" pain, they focus on their belief that they like fatty foods - so they overeat. Overeating conflicts with their "be healthy" belief and, eventually, they feel more pain from not being healthy (their favorite shirt doesn't fit). Because they've been eating what they like, they feel very little pain from the "I like fatty foods" belief; so they, temporarily, change their behavior and diet. This works, until people start complimenting how they look, their shirt fits again and they have been denying themselves their favorite foods. Because of the denial the "fatty food" pain, becomes increasingly acute, causes them to overeat and the cycle repeats. So, what does this have to do with growth and the current challenges we are dealing with in the economy. Let's take a look at two, typical beliefs held by growing companies: "expand opportunities" and "control or cut costs." When the economy and markets are good and revenue is more than covering expenses, businesses feel relatively little "cut/control costs" pain. So they get lazy and, in the name of "opportunism" and poor strategic planning, pursue opportunities with little discipline. This causes costs to rise at a greater rate than the rewards of their investments. As a result of rising costs or a change in market conditions, the "cut/control costs" pain increases significantly. Add to that the "opportunity binge" companies have been on, there is relatively little "expand opportunities" pain. Just as people who wake up and realize they can't wear their favorite clothes, companies go on a "crash diet" and cut expenses with little strategic thought. The lack of strategy and discipline that applied in the growth cycle applies equally in the cut cycle and mistakes are made, weakening the company. Keep in mind, the companies beliefs have not changed - they still believe in expanding opportunities, it's just that the "cut/control costs" pain has become more acute that the "expand opportunities" pain. Eventually, the cycle shifts as the "expand opportunities" pain becomes greater than the "cut/control costs" pain. And the cycle repeats. This is precisely where the vast, vast majority of business find themselves - they're in the exact same position as people who struggle to lose weight. Just like the diet shows, gimmicks and shortcuts don't work for people, shortcuts don't work for businesses. What's the solution? Stop the insanity (yes, that's a pun for those that remember one of the funniest diet gimmicks ever)! Fritz says that if the focus is on behavior - change will not stick. Over long periods of time, behavior always follows structure. The answer then is to change the structure and to integrate the beliefs. In business, this means that you have to stop looking at "cut/control costs" and "expand opportunities" as opposite ends of the spectrum. You must get out of the good market/bad market mindset. Companies should always be cutting, controlling, and expanding. 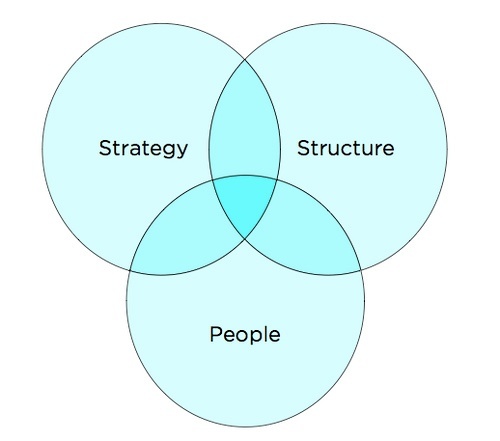 Here's my challenge for you: How can you combine strategy, structure and people to enable you do get the work done by four people to be done better by three? If you're always asking (and answering) that question, growth will become consistent and market conditions won't control your destiny.